New Media Labs was founded by Paul Cartmel. New Media Labs is first and foremost a technology company. NML is not a digital agency. We prefer to act as a technology skills provider either for agencies or directly for clients. Our entire staff contingent comprises Computer Scientists and Engineers. Our 3 core areas of interest are: niche social networks (Enterprise2.0/Social Software solutions); Mashups (a new web application that combines data and functionality from various existing sources); and, Mobile (both application and mobi sites). NML have a wide array of clients (mostly in the banking and insurance space) and we’ve delivered applications that differ in complexity from very simple Word Press sites to complex social media applications for banking. We build web applications – not websites. Our focus is on client acquisition and client retention through social platforms that are tied to the client’s business model. We have utilised our services revenue to build a number of applications and platforms, namely, a social software framework, an ASP.Net MVC CMS, a platform for Niche Social Networks hosted at WeLove.net and a number of mobile applications. Knowing your consumer and how to customize your message to every individual is important because it will directly correlate to their purchasing decision. The better you can understand and connect to your audience, you have a greater chance of selling them your product. 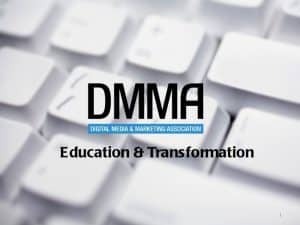 At the DMMA website, you can find digital media marketing specialists that are trained to help you achieve that.